I did not see this in the news anywhere, not even at the exchange own website, but Taifex is now publishing an official volatility index based on benchmark TAIEX Index options - English, Chinese. The exchange licensed CBOE methodology, and is publishing two versions of the index - the VIX equivalent based on the var-swap methodology, and VXO/old VIX based on Black-Scholes ATM IV. I think it is actually a good step - volatility skew is not very informative in the emerging markets, and VXO method is more robust when OTM options liquidity is limited. 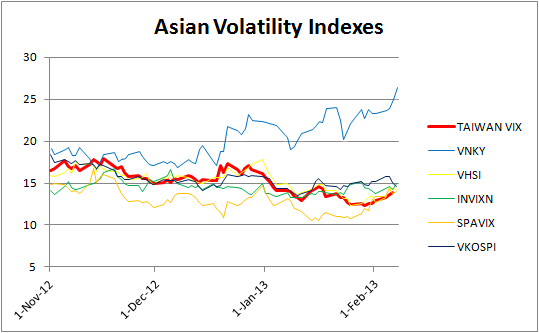 Below is the chart of recent performance of Asian volatility indexes - Taiwan VIX is very close to VHSI (volatility index of Hong-Kong) which is not surprising. With the exception of VNKY (Japan) all indexes have been in slow decline over the last few months. I could not find bloomberg ticker for the new index, if anyone knows please email me. Why do you say it's "not surprising" that Taiwan VIX is very close to VHSI? Did you ever find out what the Bloomberg ticker for Taiwan VIX?